The Crew 2 will receive its second major free content addition on December 5th, Ubisoft has announced. This release will be available to all players for free, and introduces a new motorsports discipline with Demolition Derby, alongside the eagerly-awaited PvP mode. 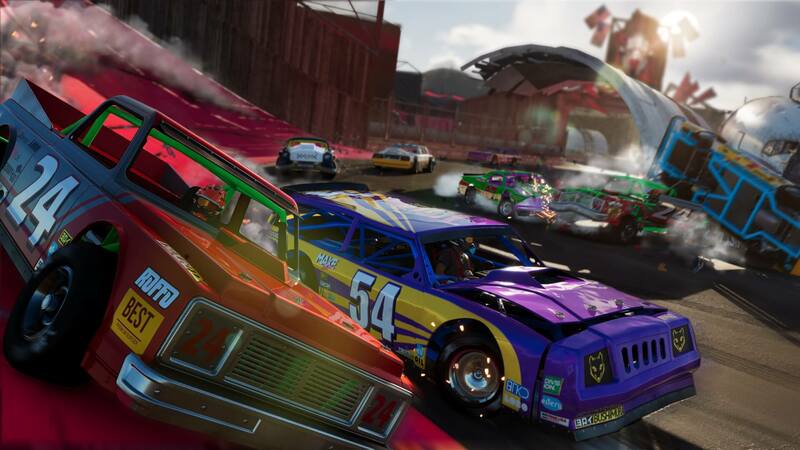 Demolition Derby is crashing into the Freestyle Family as the next motorsports discipline for fans of Ubisoft’s latest open-world racing game to enjoy. 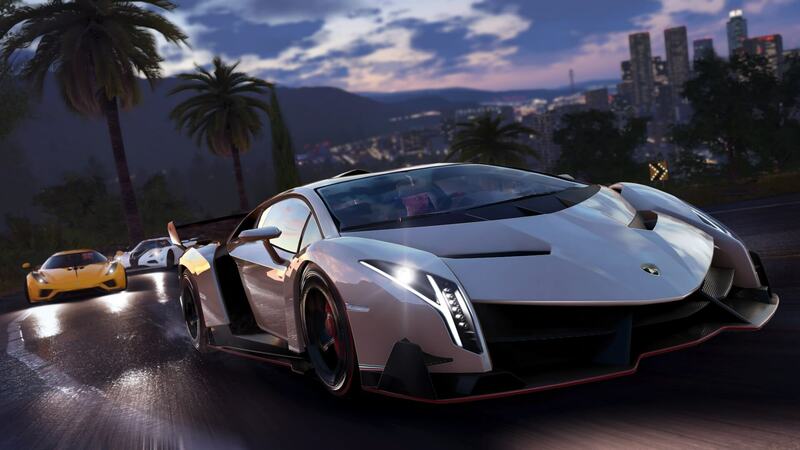 It will allow players to get behind-the-wheel and roll bars of vehicles that are fully destructible. Events curated around this discipline will be available in two exclusive spots around the United States, with a total of eight unique challenges for players to engage upon. Right in the heart of the Bonneville Salt Flats, developer Ivory Tower has created a brand-new arena designed specifically for the chaos and carnage that will result from Demolition Derby. Once unleased into this obstacle-laced circuit of destruction full of falling elevators, spring-loaded boxing gloves, and other vehicles, players simply have one goal – and that’s taking down the vehicles driven by their opponents and destroying them whilst keeping their own in the best shape possible. Bonuses will occasionally be dropped across the arena, rewarding those who are the fastest to reach them. Other Demolition Derby events will take players racing around a new circuit. This race course has been built in the heart of the Tucson aircraft cemetery and will see drivers battle it out to reach the top of the pack whilst ensuring they aren’t shoved off the track altogether! Ubisoft will also introduce a total of 14 new vehicles to The Crew 2 with its Demolition Derby update. 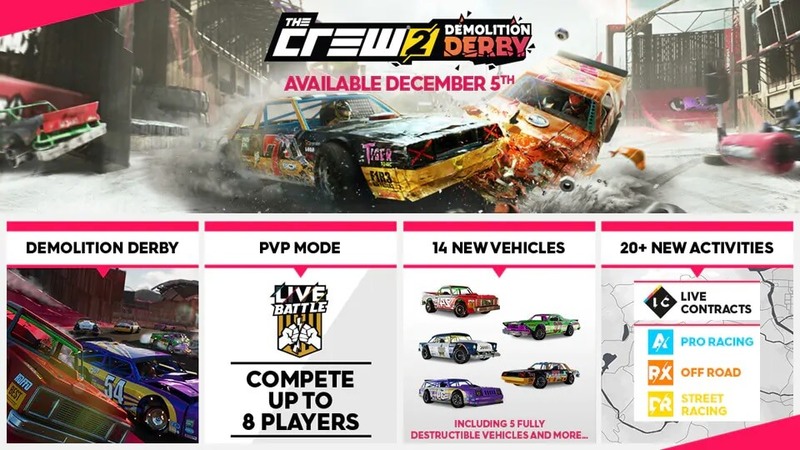 The first six have already been revealed by the publisher, with four Fender Demolition Derby cars available to earn or purchase with in-game credits from December 5th. These include the Fender Firenze, the Fender Vero, the Fender Frontiera, and the Fender Bulk. With the release of the Demolition Derby update also comes the cars of the December Vehicle Drop, which includes new additions specific to both the chaos and fun of Demolition Derby, as well as the Air Race discipline. These include the Fender Rattlesnake and the 2009 Extra Aerobatics 330SC. Both vehicles will become available at no cost to Season Pass holders on December 5th before being made available for standalone purchase for all other players on December 12th. The remaining eight vehicles coming to The Crew 2 with the Demolition Derby update will be revealed in the future. Ubisoft says they will also include new Icon Level rewards, too. Furthermore, new activities for existing motorsports disciplines will become available in The Crew 2 with the release of this update. Like the Gator Rush update in September, the Demolition Derby update features new events for the Drift, Alpha Grand Prix and Rally Cross disciplines. There will also be a new episode in the ‘LIVE Xtrem Series’ – a Holiday Special, as well as 10 new Skills to beat in freeroam. Live Contracts will also be enabled in this update, and players will be able to receive Daily Contracts offering Crew Credit rewards from the LIVE Bus accessible in every HQ. These contracts will be randomized and unique for each player and can be based on any of the in-game activities in The Crew 2, such as events, skills, photo ops, treasure hunts, freestyle and roaming, to only name but a few. Players will receive one contract per day, as well as one re-roll. There’s no time-limit to complete these challenges, and uncompleted ones will appear the following day, along with a new daily contract – allowing for a maximum of three active contracts to be stacked. Ubisoft will also introduce eight new Demolition-themed Photo Quests with its Demolition Derby update for players to tackle, as well as the long-awaited PvP mode. This head-to-head mode dubbed ‘Live Battle’ will allow up to eight players to complete against each other in a free-for-all experience across all four motorsports families available in The Crew 2. You can find out more about the PvP Live Battle experience in our dedicated article for the mode.